Yes, home stagers rely on visual tricks to draw in potential buyers and point to a room’s best attributes. Think: a large plant near a window with a view, or a cluster of pillar candles next to a gorgeous stone fireplace. They’re smart tactics, to be sure, but some of them are best employed after you shoot photos. You want to help buyers see the entire room in your photos, so avoid setting up obstacles that visually impede your home’s flow, Mountcastle suggests. “For example, some people put beautiful flower arrangements on a coffee table or a dining room table, and while it may look good, it stops the eye from flowing through to the other side of the room,” he says. Another tip: Ditch the rugs and runners—you’ll expose your floors and create the illusion of more space. Small advises homeowners to turn on lamps and lights—inside and out—but to turn off ceiling fans. You want to showcase as much of every room as possible. But that doesn’t mean lots of close-up photos of every corner (or any corner, for that matter). Instead, aim to include three walls in your image, to give each room depth. Often, that means shooting from the doorway or a corner, Small says. Everyone knows that the key to taking a good selfie is to shoot from above (goodbye, double chin!) But the rules are different when it comes to getting your home’s good side: In real estate, Mountcastle says, you want to keep your camera at about chest height and shoot straight on (no fish eye, no aerial shots, etc.). The key to a clean-looking photo is a clean house. 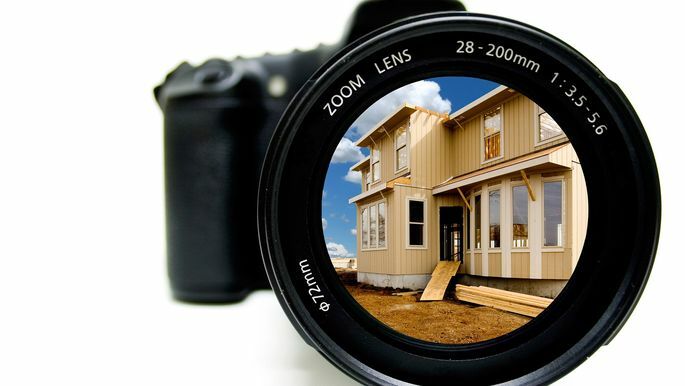 Bottom line: Buyers scan house photos very quickly, so make yours stand out.